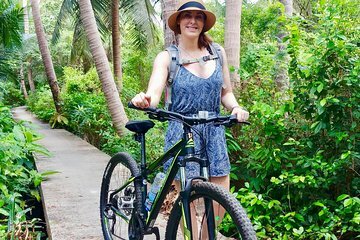 Discover some of Bangkok’s beautiful natural spaces on a 4-hour small-group bike tour. Pedal through Benjakiti Park and admire the beautiful Bangkok skyline, explore local markets and canals, and visit the massive green space of the Bang Krajao peninsula. Enjoy light refreshments and water throughout the tour as well as a delicious Thai lunch while visiting Krajao. Great day - everybody going to Bangkok should experience this. Fantastic to bike in the green lungs of the city, just across the river. Briliant guide - thanks for that. I can only recommed to take this tour.